Cutting two parallel girdling rings about 6 inches apart helps ensure that girdling will kill the tree, leaving a standing dead snag. 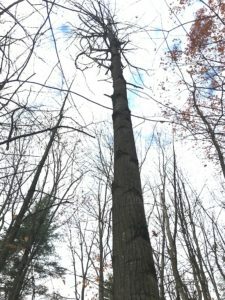 This week I had the opportunity to fell and girdle large trees in a family forest in New Haven. 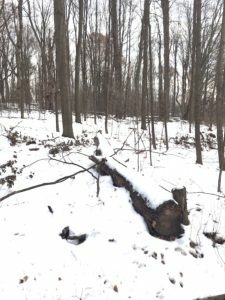 The managed area is part of a 12-acre mesic maple-ash-hickory-oak forest community dominated by sugar maple, black and white birch, hardhack, and scattered old field white pines. This treatment was part of a cost-share practice funded through the Natural Resources Conservation Service (NRCS). 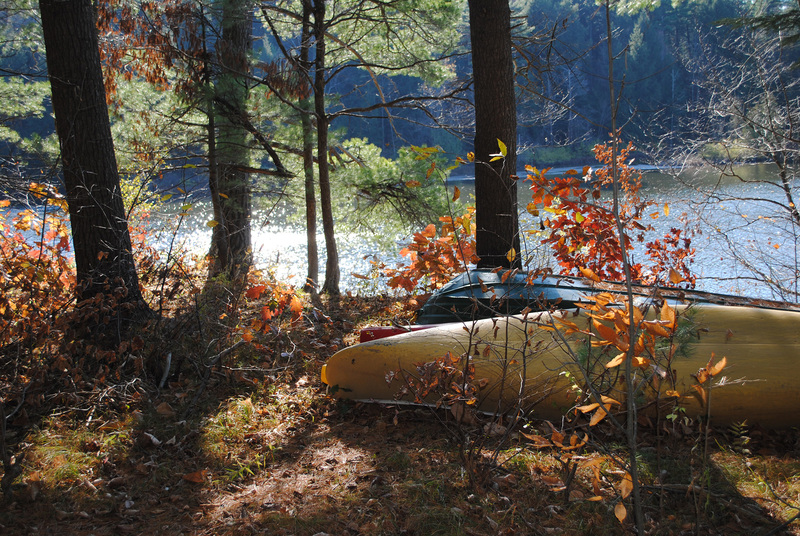 In his classic conservation essay, The Land Ethic, Aldo Leopold writes that “wilderness is the base-datum of normality—a picture of how a healthy ecosystem maintains itself.” Walk through almost any old growth, wild, untended northern forest and there will almost always be huge trees, lots of age class diversity, and many species of fungi and herbs. The streams most likely will be clear and highly oxygenated and the soils will be rich in humus. 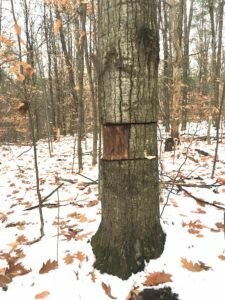 Species like sugar maple and basswood thrive under these conditions. Wildlife species richness is often highest under these conditions as well. Dead crown of a girdled aspen. Rich habitats for a wide variety of detritivores and decay organisms like mushrooms. This girdled tree eventually snapped at the upper girdle ring. The tree continues to nurture forest health, now as downed woody debris. Vermont Family Forests encourages landowners to leave more of this wood in the forest. In addition, we encourage family forest owners to manage for at least four large and secure cavity and snag trees per acre and at least four large downed trees per acre. 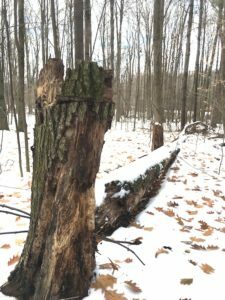 Two great forest management practices to encourage standing dead snags and large downed wood are Tree Girdling and Drop & Chop Cutting respectively. At the New Haven forest, the NRCS had flagged four large trees in blue for treatment. These included three rough old sugar maples and one old field white pine. It would have been hard to find a place to fell them without taking out many trees we would like to grow. NRCS knew this and called for girdling them instead. Drop and chop cutting adds habitat, water storage, and soil-building humus. Done with precision-felling techniques such as those learned in Game of Logging, felling can be done with minimal damage to surrounding trees. Using a small chainsaw, I cut two parallel rings about 6 inches apart to sever the bark, cambium, and a little of the sapwood. Using this method, materials stored in the roots can still be translocated to the crown, but fresh photosynthates are restricted from getting to the roots. Ideally, over several years, the trees will die slowly and cast off their branches a little at a time. NRCS had marked four other trees—a huge declining aspen, a black birch and two weevilled pines—for felling. Using Game of Logging techniques—which help the feller place a tree exactly where he or she wants it to go—plus a Jonsered 16-inch chain-saw, two felling wedges, and a cruising axe, I felled the aspen, birch, and one of the pines across the land’s contour to slow, spread, and sink storm flows, to add spongy retreats for critters, and much more. To avoid damaging the residual stand [surrounding trees], I felled the other white pine straight downhill. Tree Girdling and Drop & Chop Felling practices minimize negative impacts to the forest floor and the residual trees. The work can be done quickly and the associated costs are minimal. With a little training, many forest landowners can safely accomplish the work themselves. Best of all, the whole forest ecosystem can benefit by leaving the wood in the forest to rot and to work its many wonders.